It’s almost time for sundresses, shorts, and swimsuits, which for many women, means one thing: it’s time for hair removal. This can be a real chore, especially for women who choose to shave. Who wants to have to worry about leg hair every other day? This is where waxing comes in as an excellent alternative. However, many individuals feel intimidated by waxing, and may believe a variety of misconceptions about waxing which (understandably) deter them from giving it a try. If you have questions about waxing, we are more than happy to help answer them. In the meantime, here are some common myths about waxing, debunked. MYTH: When you wax, you don’t need to exfoliate. Many people are under the assumption that if you wax, you don’t need to exfoliate. While waxing does have an exfoliating effect on the top layer of your skin, this doesn’t excuse you from using a dry brush or sugar scrub before and after waxing. Exfoliating before your waxing appointment reduces your chances of developing ingrown hairs by shedding dead skin cells ahead of time. You will also want to exfoliate the skin about 24 to 48 hours after your wax for the same reason. MYTH: You have to let the hair really grow out before you wax. Some people stay away from waxing because they don’t want to have to wait for their hair to grow out before waxing. In reality, your hair only needs to grow out about a ¼ inch before you can be waxed again. For some people, this happens in as little as two weeks, though many people choose to get waxed once a month. 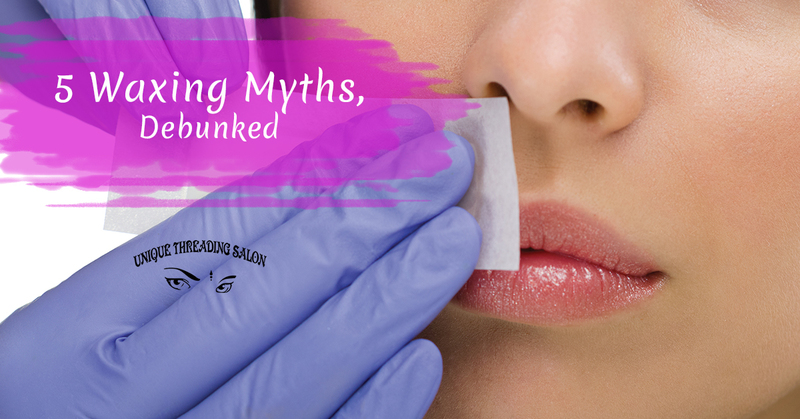 MYTH: You won’t have ingrown hairs if you wax. Ingrown hairs can happen after any type of hair removal if you don’t properly prepare the skin. Again, exfoliating before and after your wax will be key to preventing ingrown hairs. In addition, there are many ingrown hair treatment creams on the market that help reduce the prevalence of ingrown hairs. Have you been avoiding waxing your eyebrows because you’re worried that you’ll get wrinkles? Sometimes, people believe that because the skin around eyebrows is thinner, that waxing is too harsh, which is why they see crow’s feet around their eyes. In reality, this is simply a part of the face that is especially prone to signs of aging, and it has nothing to do with waxing. If you’re concerned about wrinkles, make sure to keep your skin healthy through staying hydrated, applying sunscreen, and getting regular facials. MYTH: You cannot get waxed if you’re pregnant or on your period. There is a common misconception that if you are either on your period or pregnant, you cannot get waxed. This isn’t true. Either way, we can help you. However, please be aware that due to the hormonal fluctuations, you will be more sensitive and waxing is likely to feel more uncomfortable than normal. At Unique Threading Salon, we are happy to help you with your hair removal needs in Chelsea, whether you’re looking to wax your legs or thread your eyebrows. Contact us today to schedule an appointment with one of our experienced technicians!